Want a better score? Maybe your shirt could help. Yes, even golf shirts these days are designed to help improve your game. With the latest sweat-wicking, micro-fiber cooling, zero-friction designs, the right golf shirt can help give you the upperhand on the course. Here is our quick look at some of the best golf shirts available today. Nike burst onto the golf scene with Tiger Woods back in 1996 and has since become one of the most dominant brands in golf. It also makes some of the best golf shirts available. Their Tech Core Stripe Polo Golf Shirt is one of their most popular designs, and for good reason. Made from Nike’s signature Dri-FIT material, an innovative mesh stripe design allows for superb ventilation. This shirt is guaranteed to keep you sweat-free on those hot summer days. The material is light, and stretches so it will not restrict motion, or affect any part of swing. 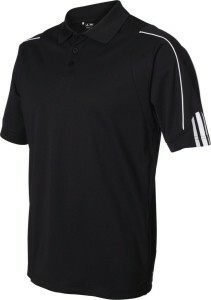 Overall, the Tech Core Polo golf shirt fits great, feels great, and is our favorite golf shirt on the market. Since it is Nike, the shirt can be a bit pricey at around $40-$60 (depending on color/fit), but once you try it you’ll never go back to normal cotton shirts again. Puma is relatively new to the golf apparel world, but they are starting to make their mark. A few big name professionals that wear the Puma brand are Rickie Fowler, Ian Poulter and Graham DeLaet. 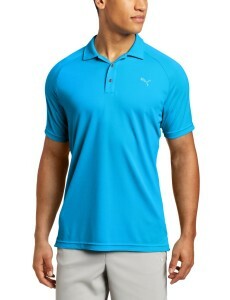 Despite being new to the game, Puma has managed to create a fantastic shirt with the Raglan Tech Polo. This shirt uses a sweat-wicking fabric (similar to Nike’s Dri-FIT), and has mesh panels to keep you dry and cool in hot weather. It also offers UV protection (UPF 40) with sleeves designed to reduce friction when you swing. A key point with Puma’s designs is that they always offer bright, and unique colors. So, if you want a golf shirt that performs well and helps you stand out from the crowd, then the Puma Raglan Tech Polo is the shirt for you. Note that this shirt fits a bit tighter than what you might be used to, so make sure you order a size up. Despite the fact that Adidas owns TaylorMade (the top driver brand in golf), and has some big name golfers on its roster (Sergio Garcia, Jim Furyk, Dustin Johnson, Jason Day), it has not been able to achieve the same popularity in apparel as rival Nike. But, this doesn’t mean that they don’t make great shirts! The A76 is one of the best golf shirts available. It is light, breathable, and like other top shirts uses special microfber material that wicks away your sweat to keep you cool. Better yet, the A76 can be found for over $10 cheaper than the other best golf shirts on this list. The one flaw is that these shirts actually fit BIGGER than what you may be used to. So, if you order one, make sure you get a size down. Under Armour pioneered the entire microfiber, performance shirt industry back in the 1990s. They started with football, but have since moved to other sports, including golf. Under Armour has yet to make much of a mark in the golf world, but that doesn’t mean their shirts aren’t great! The UA Performance Polo is the perfect example — it is light, flexible, and uses Under Armour’s signature microfiber fabric to keep you dry and cool. This shirt also features UV protection (30+ UPF) to protect your body from harmful rays. It also has anti-odor technology to keep you smelling fresh. It is a bit pricey, but well worth it if you want a high-performance shirt. Callaway is the only pure golf brand to make it on this list. They are better known for making awesome clubs (Big Bertha drivers are back! ), but also have a great apparel line. 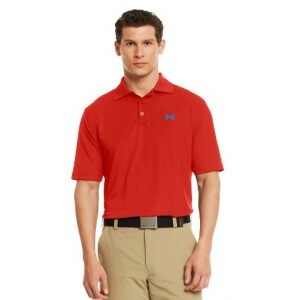 The Razr Solid Performance Polo is our favorite Callaway brand shirt. Like the other shirts on this list, it is made of fabric that will wick away your sweat to keep you dry and cool in the heat. 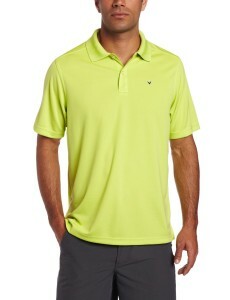 Callaway has released this shirt in a huge array of colors, so you are sure to find one that fits your style. 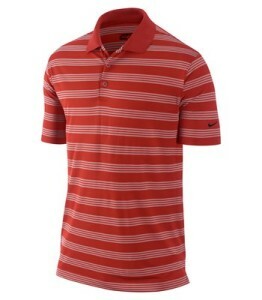 If you have Callaway clubs, and want a matching shirt, then the Razr Solid Performance Polo is definitely for you. What are the Best Golf Pants? The Best Winter Golf Gloves for Cold Weather What are the Best Women’s Golf Shoes? What are the Best Golf Shorts?